The spirit of a constitution is in its in preamble. A preamble is essentially a summary of the constitution that lays out the objectives in a lofty language. Most constitutions have justice, equality, freedom, etc. as objectives. Even the Lancaster House Agreement of 1979, the de facto Constitution of Zimbabwe which was effective until 2013, list similar objectives. Zimbabwe is evidence that good constitutional objectives do not make a good society. First, the mechanics of implementation contained in the body of the constitution has to jive with the lofty objectives in the Preamble. More importantly, the society that ultimately determines the course of their constitution in action has to value those attributes. If justice, equality, etc. is not part of the culture of a society, despots with popular appeal can hijack even the best constitution. As Mat Ridley argues in his book, ‘The Evolution of Everything,’ humans are continuing to evolve with values that lead to societies that are more just and free than their precedents. Ups and downs are possible in particular places or periods of time, but the overall trend in the human race has been towards less violence and more cooperation. In this paper I argue that, at this particular juncture in Sri Lankan society, constitutional reforms may be needed to fix some of the functional aspects of governing, but for true progress we need leaders in political and non-political space, including media and civil society, to nudge people to rediscover their inherent human values. As some argue, the real preamble to the US Constitution is found in the Declaration of Independence in its Phrase “We hold these truths to be self-evident, that all men are created equal, that they are endowed by their Creator with certain unalienable Rights, that among these are Life, Liberty and the pursuit of Happiness.” The phrase is significant in that it brings home the concepts of justice, equality etc. to the individual level in terms of a person’s right to pursue Happiness. If our constitutional council were to reword our Preamble, I would like to see a reference to the individual ‘in addition to’ or ‘in place of ‘the reference to People in a generic sense. Despots can hide behind the slogans of the ‘Welfare of the People ‘to ‘peopalise’ or ‘Jansathu’ private property and expand government institutions to fulfill politician’s private or political needs, at the expense of rights of individuals who receive low quality of services from these institutions, in addition to paying for their upkeep through taxes. Currently, fundamental rights clauses are invoked to go to courts on various issues. What we need is to have the principle that “individuals have the right to protect themselves from the excesses of government” to be presented as a value that permeates throughout the constitution. The Indian preamble apparently was ratified after the ratification of the main text of the constitution. This is an interesting way to go about drafting or amending a constitution. First you outline the greater objectives of the constitution, then you complete the functional aspects of defining legislative, executive and judiciary functions etc., and then they you go back and check if indeed the objectives stated in the Preamble are met or violated in anyway by the functional aspects. There is no evidence whether this was the case in constitutions making in India or Sri Lanka, but it is an idea worth considering. 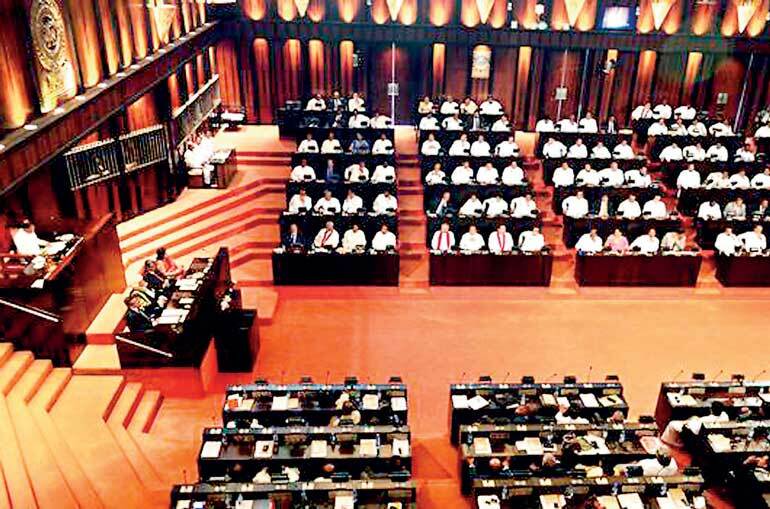 If the body of the 1978 Constitution of Sri Lanka was checked for compatibility with the preamble, some of the excessive powers of the President could have been removed. From what we have seen in the past decades, the position was used rob us as a People or as individuals of our FREEDOM, EQUALITY, JUSTICE, FUNDAMENTAL HUMAN RIGHTS, and violate the INDEPENDENCE OF THE JUDICIARY. However we should not forget that more than the language in the constitution, it was the tacit condoning of these violations by a majority of people in the name of religious ethnic and other concerns they value. In a previous article, I summarised a list values that societies at their best seem to endorse as – openness to new ideas and ability to actualise ideas with civility to others. The original list was from the work by Petersen and Seligaman (2004). Indeed as historian Tocqueville and other shave noted, the United States which was formalised as a new country only 1776, rapidly rose to be super power due to these attributes of its people. In contrast, in our parts of the world, superstitions have an untoward hold on our societies. Former President seems to continue his belief in astrology and occult, encouraging superstitions at every level of society. A relatively well-educated person known to me, being told by a Kattadiya that his dead parents are born as low life forms and are hanging around his ancestral home causing obstacle to his progress, paid for an elaborate performance by the Kattadiya to ‘bottle’ those spirits and dump them at a four-way crossroad to get lost and not return! Secondly, people have no confidence in in their ability to define their life-paths for themselves. Security and stability concerns outweigh grit, courage, perseverance and other values that make an individual a productive one. As a young entrepreneur remarked recently, parents are major obstacles in this regard. Teachers want their children to be doctors or engineers or failing that become teachers. Government servants want their children to become doctors or engineer or failing that become government servants like themselves. Civility too is a serious issue. We can be civil to each other in our circles of family and friends, but that civility does not extend outside of those circles. In fact there is the notion that you cannot trust those who are outside of those circles even in commercial transactions. A new constitution will not change our mentality. Political leaders will not risk a large-scale attack on closed-mindedness and superstitions because those attributes are closely linked to traditional values. They are also not going be hard on youth seeking safety in government jobs. The opposition is not going to lead these crusades either. Here media and civil society have a huge responsibility to revaluate the values they communicate through their publications. A good example is the cartoon character Suwaris in the Lankadeepa newspaper. Why does Suwaris walk around with an empty malla (bag), following politicians and making smart cracks at them? What does Suwaris do for a living? If he is just a hanger-on, isn’t the cartoonist advocating that unproductive lifestyle by making Suwaris the medium for political commentary? If humans are by nature open, productive, cooperative and considerate for survival sake or otherwise, what we need are systems that nudge our society back to its norm. A constitution can only provide a rudimentary framework. If leaders have no respect for constitution, if the media is lethargic or even afraid or people seemingly condone undemocratic behaviour such a society is doomed to perform below the norm. The book ‘Nudge: Improving Decisions about Health, Wealth and Happiness’ by Thaler and Sunstein (2009) goes into detail as to how policymakers could use. Matt Ridley talks about the need to enable conditions for individuals, communities or smaller units of government to discover innovative ways to change society through small-scale experiments. We should look at those options in more detail. The days of grand constitution-making led by giants like B.R. Ambedkar of India or Thomas Jefferson of USA are over, I think. These are not ideal times for constitutional changes, in Sri Lanka in particular. There is still too much meanness and the atmosphere is still racially charged. But we may not have another chance. The present national government, strange beast as it may seem, is still our best chance for reforms. 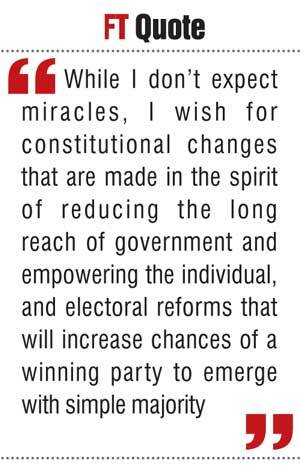 While I don’t expect miracles, I wish for constitutional changes that are made in the spirit of reducing the long reach of government and empowering the individual, and electoral reforms that will increase chances of a winning party to emerge with simple majority.